Our neighbor, Baby’s Perfect Gift, calls itself a “children’s boutique” because it’s not just a store. A store has items on the shelves that parents can choose to buy, but Baby’s Perfect Gift gives mothers and families support, advice and custom shopping options. 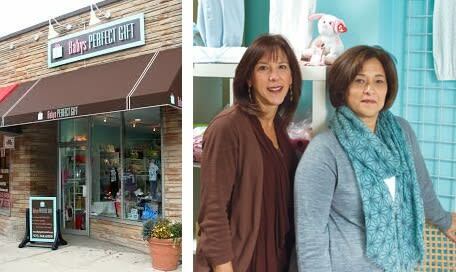 Since opening a brick and mortar location of their successful website of the same name on Bellevue Avenue, Montclair, N.J., store owners Marcia DeOteris and Ilene Goldmeier have been able to focus on customization and personalization of their products and their services. Fifteen years after the website launched in 1995, the two business owners opened a location in Montclair. Since opening the store in 2010, they have seen a big response from the community, which appreciates places that specialize in the unique, custom and local. And Baby’s Perfect Gift fits the mold by breaking others. The store offers monogrammed bibs, organic gift baskets as well as all types of shower gifts and nursery accessories. Ilene and Marcia will talk and walk through all of their items with new or expectant mothers who want to outfit their new babies. They’ll help pregnant mothers pick out clothes, accessories and toys for either gender. If the mother doesn’t know if she’ll have a boy or girl, Ilene and Marcia will put items for both genders aside, so that everything is all ready when the baby comes home. They’re able to go the extra mile because they care about service and their customers. Customers aren’t always mothers either, many times people are shopping for mothers or babies because people register for their baby showers at the shop. But whether it’s clothes or other top sellers at Baby’s Perfect Gift like the a Radio Flyer Walker Wagon, a pillow or sneakers, another big part of the business’s success is because of the customers in Montclair. Operating a business that’s so specific and so personal may not be as successful in other places as it has been in Montclair. It has a lot to do with the community as well as with the atmosphere of other businesses in the area. The store and Montclair’s residents work well together. In an age where local businesses can fall by the wayside in favor of national chains in shopping plazas, customers have stuck with Baby’s Perfect Gift. “The thing about Montclair is that it has the downtown shopping area. The people who live in this area are very supportive of the local businesses. Running a specialty store here is different than in a lot of other areas because of that,” DeOteris explained. Baby’s Perfect Gift and Montclair mesh well together. Residents in town want get their children’s and their friends’ children’s clothing and gifts from people who are knowledgeable and caring, and Marcia and Ilene want to offer a welcoming space where people can feel comfortable getting quality goods at a reasonable price.